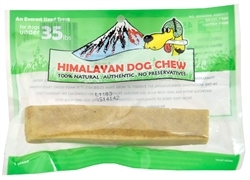 Made using traditional methods with yak and/or cow milk, and all natural products with no preservatives or binding agents. They’re also gluten-free! Depending on the size and eating habits of the dog, this can be a very long-lasting dog chew. Contains 1 Piece per pkg.